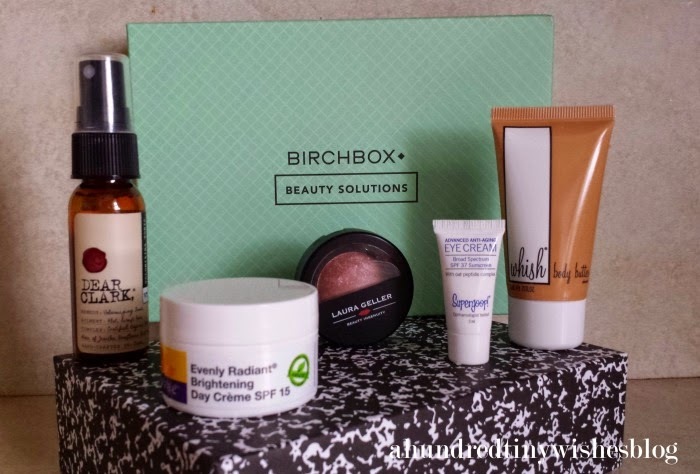 I know that it's already April, but I wanted to tell you all about my March Birchbox. I have been a subscriber for about 13 months, and I have never been disappointed. In the last year, Birchbox has actually opened up a new thing and now allows you to either pick a specialty curated box- where you know exactly what you are going to get- or you can choose one of your samples, and the rest will be a surprise. So if you don't like surprises- like me- then the specialty box is the way to go. And that's what I chose to be my March box. In my curated box- called Beauty Solutions-, I received: Laura Geller Beauty Baked Blush-n-brighten, Whish Three Wishes Body Butter in Almond, Dear Clark volumizing hair tonic, Supergoop!® Advanced SPF 37 Anti-Aging Eye Cream, and derma e® Evenly Radiant® Brightening Day Crème SPF15. First of all, I loved the body butter, and that was actually my reasoning behind getting the box. I have an obsession with almond scents.... and I love Whish. The butter is super hydrative, smells amazing, and lasts. They also have other scents- and they are also heavenly! I also really liked the Supergoop eye cream. I still have an issue with dark circles, and felt that the eye cream actually helped hydrate the area under my skin and helped with the circles. It also didn't irritate my sensitive skin. The third item that I loved was the Laura Geller blush. The color is buildable and beautiful. I did not like the hair tonic, mostly due to it's smell. I was not a fan of the actual smell, but did like my results after spraying on wet hair, and blow drying. I also did not exactly like the derma e creame. I felt that it was too heavy for my sensitive skin. I won't say that March's box has been my best box, but I will say that getting a box full of beauty related products every month is kinda awesome, in my opinion. If you want to sign up to get your own box every month, you can either use my link or go through the actual Birchbox website. Do you get a sub box every month? How do you like it?